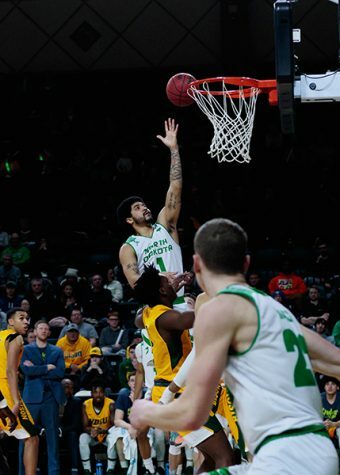 The University of North Dakota Men’s basketball team didn’t close out the 2018-19 season the way they wanted to, but they left a lot to be excited about as they head into the offseason. 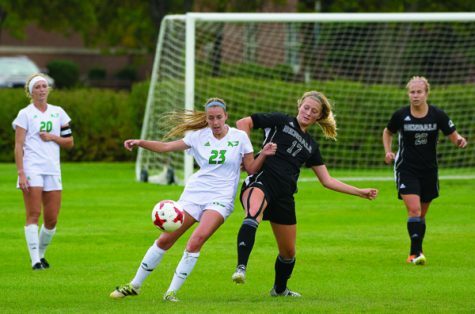 Qualifying for the Summit League Tournament in their first season as a member of the Summit League, UND (the No. 7 seed) had to take on a tough Omaha team (the No. 2 seed) in the first round. 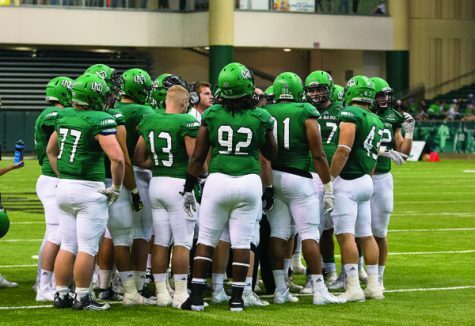 In the previous two matchups between UND and Omaha, the Fighting Hawks lost both games by one point and 18 points, respectively. Despite losing both previous matchups, it was clear that UND had the talent to compete with Omaha. 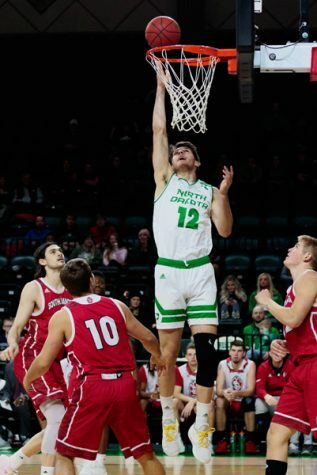 In the third and final matchup between the Fighting Hawks and the Mavericks, UND was down for almost the entirety of the first half but managed to keep the score close. Both teams had their offenses rolling for the first 20 minutes, leading to a 48-46 halftime score. 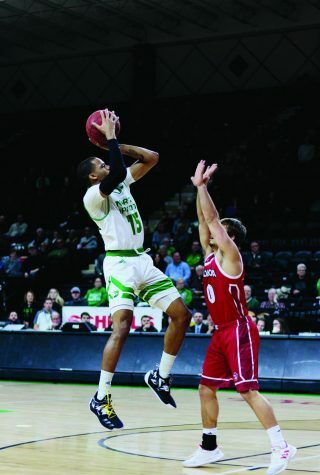 Aanen Moody, Billy Brown and Marlon Stewart led the way for the Fighting Hawks in the first half, scoring 30 of UND’s 46 points on an efficient 11-of-15 shooting from the field and 5-of-9 shooting from 3-point territory. In the second half, though, it was Stewart who took over. The junior guard scored 17 of his game-high 26 points in the last 20 minutes of play, doing his best to help UND hang around. Despite an impressive second half from Stewart, Omaha would cling to their tight lead and walk away with an 81-76 victory. 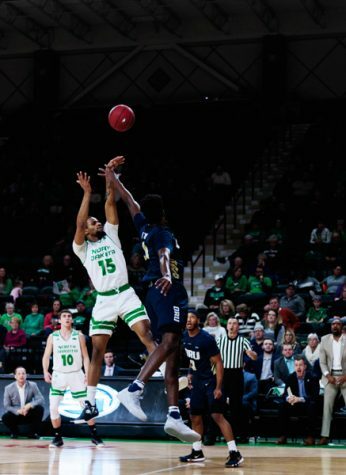 UND fought hard and made the game competitive, but ultimately, it was Omaha’s offensive rebounding that made the difference. The Mavericks hauled in 14 boards on the offensive end, giving an already potent offensive team more chances to put the ball in the basket. Any season that doesn’t end in a conference championship is disappointing, but for this UND team, that was always a lofty goal. 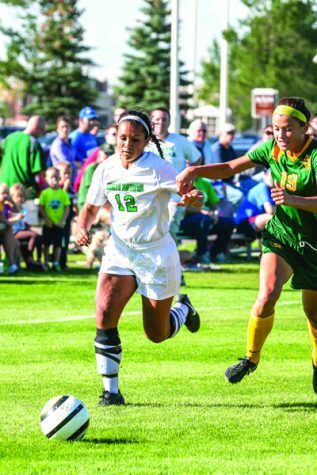 A more realistic goal for this season was to show signs of improvement and to prove that they belong in the Summit League. They did just that. “Our whole goal this whole season, really, after coming off a tough year last year, was rebuilding our culture and our chemistry and I thought we did a tremendous job with that,” Head Coach Brian Jones said. Coach Jones did a nice job of hitting on an extremely important part of college basketball in that quote. If you look at all of the top college basketball programs in the country or even in the conference, they all have an identity. Having an identity is crucial for continued success in college basketball. It’s no coincidence that South Dakota State and North Dakota State have found sustainable success. It’s all rooted in the identity of the program, and the first step in developing an identity is rebuilding that culture and chemistry that Coach Jones mentioned. UND isn’t known as a basketball school, and it probably never will be – especially with the hockey season and basketball season taking place at the same time every year – but that doesn’t mean the Fighting Hawks aren’t building something special on the hardwood. The 2018-19 season didn’t result in any championship banners for the men’s hoops team, but it was a solid step in the right direction. The future is bright for North Dakota basketball.